TravStar1 Point Of Sale SystemManager's Work Station GlossaryWhat Are Auto-Field Change Fields? What Are Auto-Field Change Fields? Taxable – Enter a “Y” in this field if you want the items taxable, enter an “N” In this field if you don’t want the items taxable. Prompt for Price – Enter a “Y” in this field if you want the system to prompt for a price when the item is rung up. Disable Discounts – Enter a “Y” in this field if you would like the system to disable discounts for the items selected. Scalable – Enter a “Y” in this field if you would like the system to make this field scalable. Random Weight – Enter a “Y” in this field if you would like to weigh items that are setup to be weighed in the Item Setup menu. Negative Price – Enter a “Y” in this field if you would like to allow the item to have a negative price. Foodstampable– Enter a “Y” in this field if the items selected will be allowed to be purchased on food stamps. Subunit of spn – Enter a “Y” in this field if the items selected are capable of being sold in bundles under different SKU numbers. Mix Match Table ID – Enter the Mix-Match code in this field to associate the items selected to a Mix-Match Code. Group – Enter the desired group number in this field. Class – Enter the desired class number in this field. Dept – Enter the desired department number in this field. Vendor– Enter the desired vendor number in this field. Manufacturer – Enter the desired manufacturer in this field. 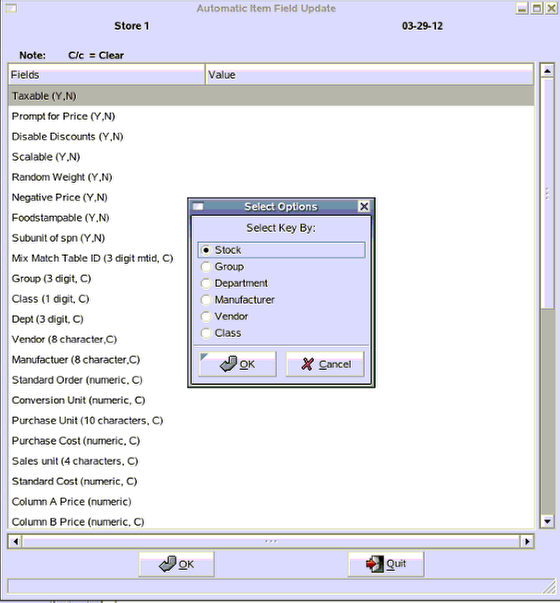 Standard Order – Enter the desired standard order in this field. Column A Price – Enter the desired column A price in this field. Column B Price - Enter the desired column B price in this field. Column C Price- Enter the desired column C price in this field. Column D Price - Enter the desired column D price in this field. Column E Price - Enter the desired column E price in this field. Column F Price - Enter the desired column F price in this field. Link PLU– Enter the PLU that you would like to link these items to in this field. Location – Enter the desired location for the selected items. Vendor Part # – Enter the desired vendor part # in this field. Minimum Level– Enter the desired minimum level of inventory for the selected items. Maximum Level – Enter the desired maximum level of inventory for the selected items. Weeks of Desired Inventory – Enter the desired number of weeks that you would like to order for. Labels– Enter a Y in this field if you would like to tell the system that all selected items have labels. Serial Item– Enter a “Y” in this field if you would like the item to be given a serial number. Non Tax Amt – Enter the non-tax amount into this field. Buydown ID – Enter the Buydown ID in this field. Note: Enter a "C" into any field to clear all the field entries for the selected group of items. Prev: What Are Item Setup Fields? Next: What Are House Account Customer File Fields?